Platinum or platinum alloy is sprayed onto the surface of a refractory material to form a platinum or platinum alloy coating. 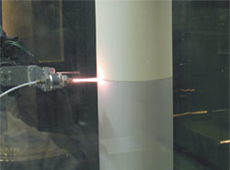 This provides dramatically improved glass corrosion resistance of the refractory material, making it possible to more effectively manufacture glass with a smaller amount of precious metals, compared with conventional platinum materials. 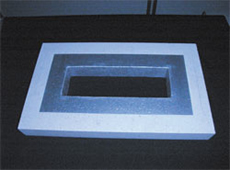 ACTTM processing technology, acquired from Johnson Matthey P.L.C., offers the combined advantages of refractory material that is resilient to high temperature deformation and platinum metal that exhibits a high temperature corrosion resistance. The amount of platinum used can be reduced to one-half to one-fourth of that with conventional platinum lined products, enabling considerable cost savings. The coating functions as a heater when an electrical current is applied. 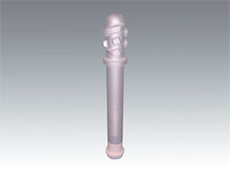 Bushing blocks, stirrers, plungers, feeder parts, thermocouple sheaths, glass melters, channel linings, refractory materials for glass production (e.g. sleeve molding equipment for glass tube production), etc.